Recognized for S.T.A.T.S., Aurora Store, philanthropic work, and more…. Good Chemistry Nurseries is a finalist for five awards from marijuana’s online news source The Cannabist. 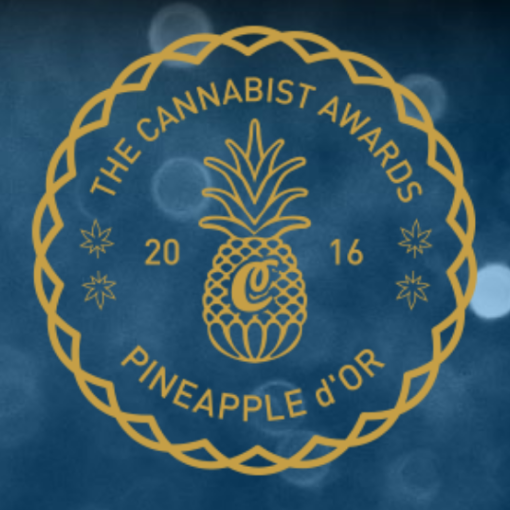 The Cannabist Awards recognize the world’s top marijuana and hemp businesses, researchers, technologists, thought leaders, products, influencers and philanthropists. This year, Good Chemistry beat out thousands of nominations to rank as a finalist in five of The Cannabist Awards categories. Good Chemistry Nurseries is recognized as a finalist for Education//Consumption for S.T.A.T.S. Guide to High Quality Cannabis; Marketing//Retail Branding for Good Chemistry Aurora; Community//Philanthropy for Good Chemistry Nurseries’ support of LGBTQ, homelessness and other needs in the community; Community//Innovation for Good Chemistry Nurseries’ Compassion Program; and 2016 Cannabist Person of the Year for Good Chemistry Nurseries’ Founder & CEO Matthew Huron. Good Chemistry Nurseries will join industry leaders at the second annual The Cannabist Awards Ceremony on November 16. Category: Education – Consumption: Speaking to the people on the complexities of this newly legal substance. On April 12, 2016 Good Chemistry Nurseries launched its innovative, free S.T.A.T.S. Guide to educate people on the complexities of assessing High Quality Cannabis. S.T.A.T.S. is a five-step process for identifying high quality, remarkable flower, not unlike the multi-step process for evaluating wine. The STATS method (Sight, Touch, Aroma, Taste, and Sensation) is a guide to helping consumers evaluate essential aspects of the flower in order to make the most informed, responsible and satisfying purchase decisions. Category: Marketing – Retail Branding: The pot shops and related business that glimmer, function, and sparkle. Good Chemistry’s 3,600-square-foot store has set the standard for Cannabis dispensaries. It offers customers an award-winning lineup of recreational marijuana products in a luxe environment that would fit perfectly in any high-end retail shopping center. In developing the Aurora location and with an eye toward continued national expansion, Good Chemistry CEO and founder Matthew Huron brought together a team of experienced professionals to implement the company’s vision for a groundbreaking retail cannabis experience that is both inviting and educational. Category: Community – Philanthropy: Giving back financially to deserving organization in need. In 2016 Good Chemistry Nurseries launched its most ambitious year yet of working on behalf of deserving organizations in need. In August of 2016, the company received a 2016 One Colorado “Ally Award” for its work advancing equality for lesbian, gay, bisexual, transgender, and queer (LGBTQ) Coloradans and their families. Good Chemistry Nurseries’ support for the LGBTQ community extends beyond the Ally Awards and Colorado AIDS Walk, with sponsorship of Denver’s Gay Pride Parade and the annual “Pink Party” at during Denver’s Gay Pride Weekend. The company supports the Denver Police Brotherhood, the Comitis Crisis Center of Aurora and the Harm Reduction Action Center (HRAC). Good Chemistry contributed to Aurora Councilwoman Marsha Berzins and Sally Mounier’s “Marsha and Mounier Series” which partnered with two agencies who work with the homeless in Aurora to assemble “Back to School” backpacks for homeless youth on and near Colfax. Category: Community – Innovation: Getting creative with corporate responsibility. Good Chemistry’s “Compassion Program” helps patients with serious health issues and financial needs obtain medical cannabis at minimal or no cost. The Compassion Program has been in place since the dispensary opened in 2009 and has served hundreds of patients with medical conditions ranging from HIV to cancer and epilepsy. The Compassion Program was born out of Huron’s own personal experience growing up in a gay household in San Francisco. His father and father’s partner both had HIV and eventually his father’s partner ended up in hospice care. Huron started growing and cultivating medical marijuana at that time just for his father’s partner – but then he started passing it around to other folks in hospice, and from there Huron began expanding the business, going to other hospices and assisted living facilities in the area, thus the “Compassion Program” was born. To apply for the program, patients fill out a simple questionnaire and provide proof of their medical condition from a primary care physician. Once approved, Good Chemistry staff will determine how much medicine a client is eligible to receive. ● Category: 2016 Cannabist Person of the Year: The one individual who has contributed the most to the burgeoning cannabis space. Matthew Huron, CEO and Founder of Good Chemistry Nurseries has deep roots in the cannabis industry – dating back to the 80’s and 90’s in San Francisco. His father and his father’s partner both had HIV and found therapeutic benefits from cannabis. In 1996, when medical marijuana became available in California, he saw firsthand the symptomatic relief patients experienced from this alternative medical treatment. In 2000, he began growing medical marijuana for AIDS patients throughout the state, founding and operating a nonprofit medical marijuana co-op. After 10 years operating the Elmar Lins Compassion Co-Op, he moved to Colorado to co-found Wellspring Collective. In 2010, he launched Good Chemistry Colorado, planning the facility infrastructure design and construction, acquiring the necessary financing and directing the resulting work. Today, Good Chemistry employs a staff of more than 100, operating dispensaries in Denver and Aurora. Matt has developed and implemented best practices in the medical and retail marijuana industry, including a Compassion Care Program that enables patients with limited resources to obtain medical marijuana at little or no cost. According to Huron, “knowing the impact you can have on really sick patients by being able to provide them with medical marijuana is incredibly gratifying” and his favorite aspect of working in the cannabis industry. Since 2010, Huron has expanded cultivation operations in two large Colorado facilities that are devoted solely to the production of more than 60 strains of marijuana, while also launching a new cultivation operation in Nevada. Further, he optimized the production of extracts and concentrates through solventless processing. In August 2016, Huron was honored for his work to advance equality for LGBTQ Coloradans and their families at One Colorado’s 2016 Ally Awards. Huron is a founding board member of the Cannabis Business Alliance (CBA) and a founder and former board member of the National Cannabis Industry Association (NCIA). He has served on the Colorado Department of Revenue’s Medical Marijuana Enforcement Division’s (MED) Licensing Authority Advisory Committee, which was charged with advising regulators on the development of production management, tax and other policies pertaining to the use of marijuana. Huron’s entire 20+ year career is a testament to putting quality and consistency above everything else.